- "I am not Elliot." I don't think I'll ever stop being amused by the odd family dynamics of the Dunkel household. That second-to-last comic reference link in particular highlights many of the reasons Elliot and Ellen are different. 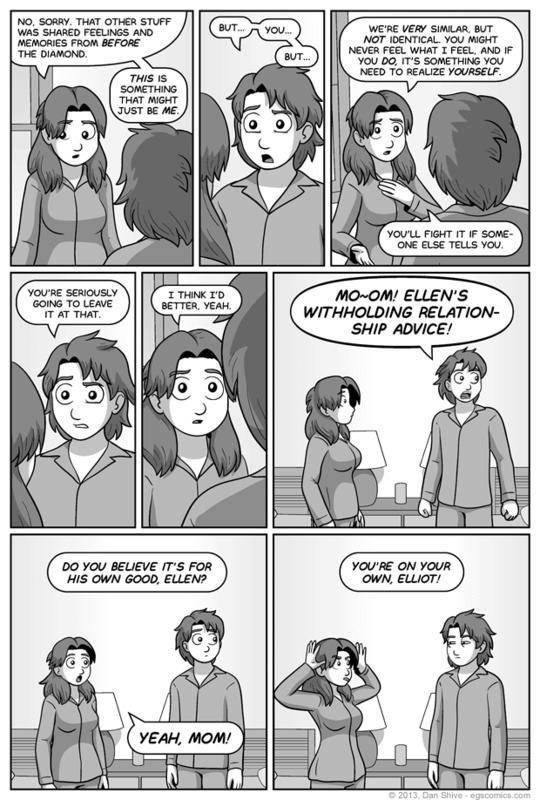 In addition to only sharing memories up to a certain point, Ellen went through a radical perspective shift (from her, well, perspective) that forced her to do all sorts of introspection that Elliot never did, she has memories of growing up in another universe entirely, a heavily modified physiology, and the fact that she hasn't rejected being female suggests her mental gender identity is also different from Elliot's (assuming Elliot even has a real sense of gender identity). And then, of course, there's that whole matter of her having a different soul, but I don't want to dwell too much on that because people have strong opinions on matters of spirituality, and OH NO IT'S TOO LATE PEOPLE ARE ALREADY ARGUING RUN WHILE YOU STILL CAN!